As I've had several occasions to learn recently, Indian cuisine is changing rapidly for the better, both in the preparation of traditional dishes and in the creation of new ones that show global influences of the vast sub-continent's food culture. Of this evolution Delhi-born Suvir Saran (below) is well aware, for he has been in the vanguard of the movement, having been chef of Devi (the first Indian restaurant to be granted a Michelin star), published three cookbooks, and is now chairman of the Asian Culinary Studies Department of the Culinary Institute of America. 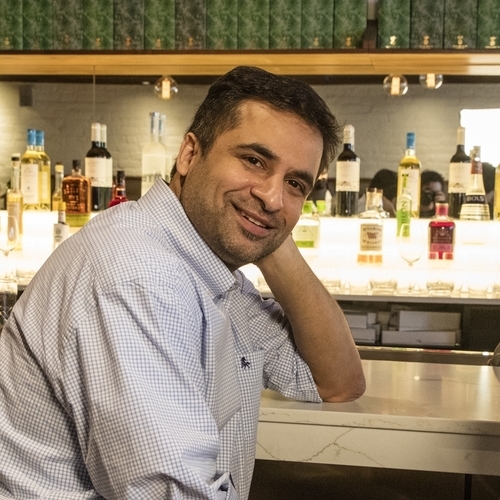 All his worldwide experience is at play at the new Tapestry restaurant in the West Village, which he co-owns with Roni Mazumdar. Saran says he's "not trying to be particularly avant garde," referring instead to his cooking as "comfort food from around the world," based on his own favorite taste memories. "Comfort changes based on the national border that you're in," he says. "Food brings us together." And much of the food he serves comes from his own farm in Hebron, N.Y., whence he gets his eggs and, soon, his pigs. 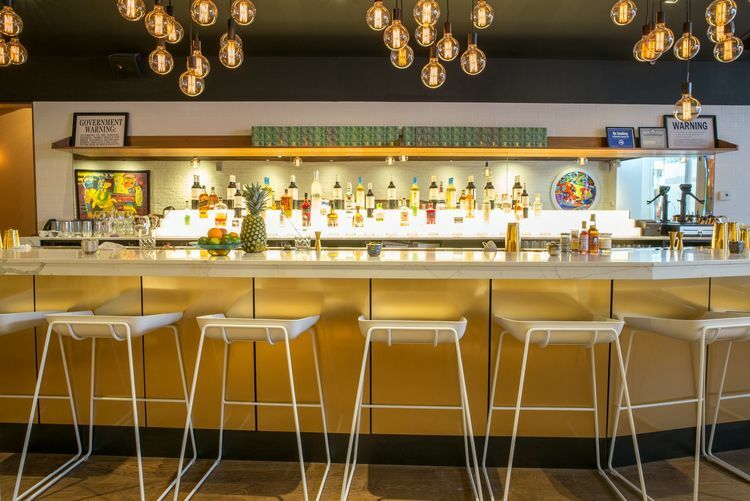 His chef de cuisine is Joel Corona, a Mexican from California, his executive sous chef is Aarti Mehta, from Mumbai; and the pastry chef is Crystal Hanks. 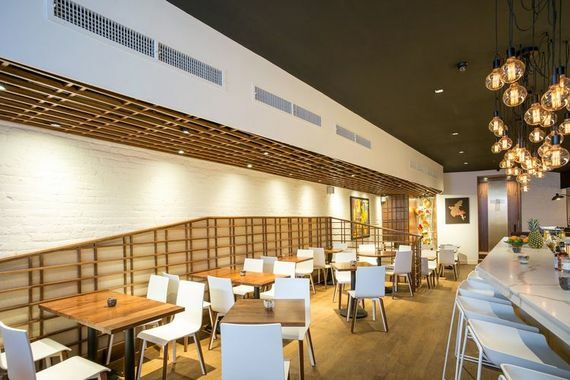 You might well expect that Tapestry would feature small plates for the table, each of them distinctive for flavors that are never muddied, like Brussels sprouts chaat with tamarind and mint chutneys, yogurt, and a black salt called kaala namak ($14). Here bruschetta gets the addition of pomegranate, cilantro, onions, mustard oil, and Parmesan cheese ($13), while tamarind-glazed chicken wings with a basil-mint yogurt sauce wonderfully evoke India ($18). More unexpected is the chicken and goose liver pâté (below) with kumquats, grapefruit, thyme and Sauternes on buttered toast ($15). So, too, smooth Rabbit terrine with fennel, pistachios, Pernod, brioche toast points and garden greens and flowers called "rabbit grazings" ($23) was much closer to the east than the west. 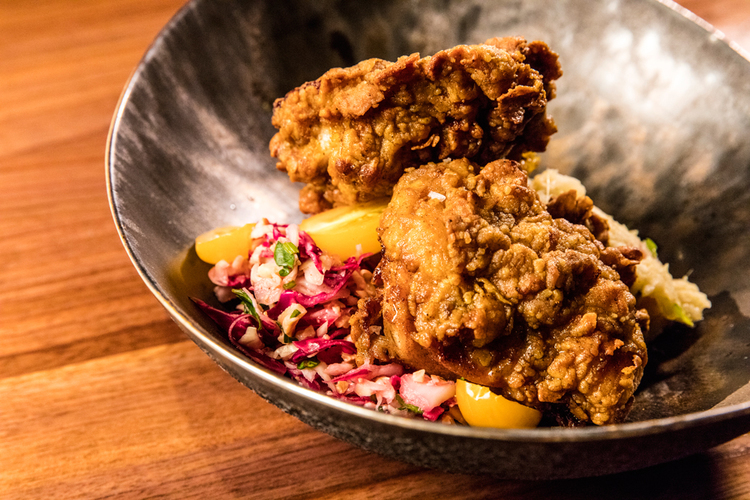 The one dish not to be missed is the crisp Masala fried chicken (below) with a crunchy peanut slaw, well-seasoned potato aloo bharta, and tangy tomato chutney ($26). The honey-glazed pork chop with roasted cauliflower, onions, and caramelized apples ($32) is another good choice, and with well-fatted, sweet-sour-spicy Japanese wagyu skirt steak come spiced greens, kumquats, nuts and falooda noodles ($45). Every dish has its specific aroma, tenderness and complexity without ever getting overpowered by chile heat. Salt, sweet, bitter, and sour spin ripples of flavor in every dish. I love seeing Pavlova meringue cake on a dessert menu, here with mango, summer berries and ginger cream ($14), and I am incapable of pushing away Tapestry's Sticky Toffee Pudding with salted caramel ice cream and brandy snap basket. Tapestry has a gregarious drinks director who has put together an exotic cocktail list and a modest wine list suited to this kind of difficult-to-match cuisine, with all bottlings offered by the glass or bottle. Mark-ups are not what I'd call easy on the wallet--Manifesto Sauvignon Blanc goes for $38, about $13 in a wine shop, though Alphonse Mellot La Moussiére 2014 at $66 is not unreasonable--but so many are under $50 that they are affordable. Suvir Saran seems to have hit a delicious balance of the old, the new, the savory and the sweet throughout his menu, both elevating Indian cuisine without losing the soulfulness of it and showing how its flavors deserve a larger role in international gastronomy.